In a statement, the ANCYL Free State referred to Gangster State as ‘Pieter-Louis Myburgh’s rubbish’, ‘garbage’ and ‘puke disguised as a book’. The book implicates ANC Secretary-General Ace Magashule, who hails from the Free State, in state capture and looting in the Free State government. The ANCYL in the Free State Province would like to notify and invite society to a session where Pieter-Louis Myburgh’s puke disguised as a book about the Secretary General of the ANC, Cde Ace Magashule will be burned. We have arrived at this sober decision driven by our deepest sense of a need to maintain a clean environment free of garbage such as this one produced by this strat-com product. We are however excited by the fact that this garbage came at a time when it’s quite cold in many parts of our province, as a result becoming the best source of much needed way to shake off the cold. It is on these basis that we have decided to have a nice fire at the Mangaung South Side dumping site and then leave its remains right there, which is exactly where it belongs with its author. It has become a matter of common knowledge that this rubbish is not only badly written but poorly researched as well, with the sole intention of casting aspersions on the character and the person of the Secretary General of the ANC. We therefore urge society to bring along as many copies of this puke as possible, as well as any material that reflects the barbaric past such as the old apartheid flag along to our fireplace. We are confident that this will remind all of those wishing to pollute our environment with rubbish to dispose of such useless and nonsensical thoughts. 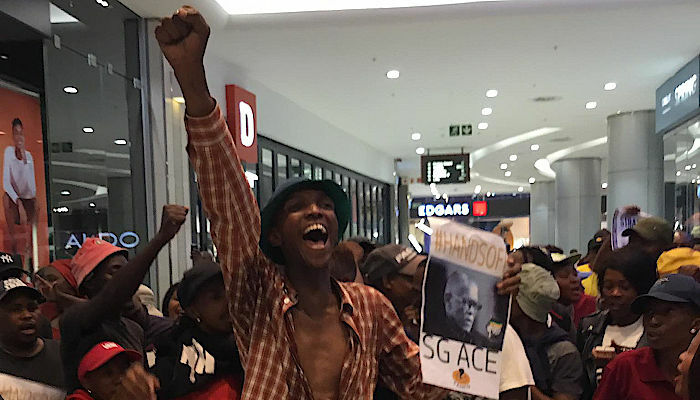 Protesters disrupted the book’s launch at Exclusive Books Sandton City last night, tearing up copies of the book and chanting ‘Ace, Ace, Ace’. The launch was subsequently cancelled. The book’s publisher, Penguin Random House, has confirmed that the book’s Cape Town launch tomorrow night (Thursday 11 April) at Exclusive Books V&A Waterfront has not been cancelled. After Gangster State was released on Sunday 31 March, the ANC released a strongly worded statement slamming media coverage of the publication, and calling the book ‘fake news’ and a ‘highly personalised and vicious attack’ on Magashule. In response, the book’s publisher Penguin Random House released a statement saying they stood by Myburgh and would not withdraw Gangster State despite criticism from the ANC.